EMS introduces a selective range of embedding and mounting medium on the market for both HOT MOUNTING and COLD MOUNTING – for literally all kinds of material specimens. 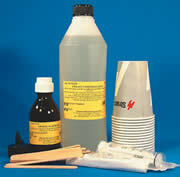 See our complete line of Embedding Media Kits. When preparation requirements include less expensive, uniform size and shape, and short processing times, hot mounting (hot compression mounting) is ideal. Hot mounting takes place under pressure in a mounting press, where the specimen is placed in a cylinder together with the appropriate mounting resin. A temperature of up to 200°C, and a pressure of up to 50kN are then applied during the embedding of the specimen. There are two types of hot mounting processes: thermoplastic resins and thermo-setting resins. Thermoplastic Resins melt when heated, offering the opportunity of repeating the process with the same specimen if the result is not satisfactory the first time. Thermoplastic resins harden during a chemical reaction with or without pressure. That means high pressure is not necessary during heating and cooling. This process is good when mounting fragile specimens. Thermo-setting Resins cure at elevated temperatures under pressure. Thermo-setting resins cannot be re-melted after mounting. iron filler Thermoplastic • • • Electrolytic polishing. Fast mounting also when used as backing. 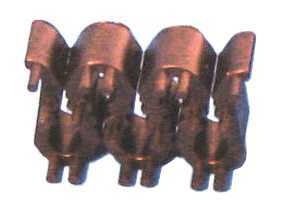 Surface electrical insulator for ConduFast. mineral filler Thermosetting • • • • For hard materials. wood filler Thermosetting • • • • • • Routine examination of soft to medium hard materials. 1215 Light Yellow Melamine with mineral and glass filler Thermosetting • • • • For soft to medium hard materials. carbon filler Thermosetting • • • SEM examination. 1. Epoxy Systems - Epoxies have the lowest shrinkage of all cold mounting resins. The curing time is relatively long, but the adhesion to most materials is excellent. They are also used for vacuum impregnation. The hardened epoxy is duroplastic and not affected by moderate heat or chemicals. 2. Acrylic System - Acrylics are easy to use resins with short curing times and negligible shrinkage. They consist of self-polymerizing components that harden with the addition of catalyst. Hardened acrylic is thermoplastic and resistant to most chemicals. 3. Polyester Systems - Polyester belongs to the catalyzed system, like acrylics. Curing times are relatively short and the hardened specimen is duroplastic. These 2 part molds may be used for all cold embedding epoxies. Comes with a detached cap for easy removal. The molds come in 3 different sizes to accommodate all of the samples you may have. The molds are made from HDPE and we recommend the use of mold release spray (Catalog #72619) prior to use. The form mold is a two part mounting cup, designed to be as user-friendly as possible. It has practical handles for removing of the lid and the cylinder is slightly conical for easy removal of the mounts. This mold is for acrylic resins only and the best mounting cup for all of our acrylic resins. 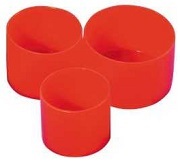 The flexible silicone rubber makes it very easy to remove the mount from the mounting cup. The rectangular flexible moldis made of very flexible transparent silicone rubber which makes it very easy to remove the mounts. The inner sides are polished, so the sides of the mounts get clear. The sides are also straight which makes it easier to fasten the mounts in a specimen holder. Mounting cup with parallel sides that help avoid tilting of the mount when clamped into a specimen holder. These reusable molds for cold embedding are made from sturdy, flexible, white silicone, and are easily removed without the need for release agents. Much smoother than rubber molds, enabling easy identification of samples in clear resins. They hold their shape to produce consistent, reliable round embedding. 1" high, ¾" internal depth. This chamber is designed in conjunction with our cold molded acrylic and epoxy media. After encapsulating the sample, they are placed inside the chamber. By applying between 30 to 40 PSI during the cure time, the mounting compound is compressed down and around the sample, forcing air up to the surface. This process helps eliminate shrinkage and increase clarity and edge retention. As an option an air pump tank is available. This Air Pump is designed for hand pumping pressure.